My name is Nina Bolen, and I'm the creator behind Happy Dragons, a cute collectable line of little dragon figurines. Nina’s art is very creative and unique. Her talents cover many different medias, including drawings, clay sculptures, jewelry, and plush figures. Nina’s currently working on goblins and the detail is mind-boggling and exceptionally realistic. As a person, she is friendly and more than happy to help aspiring artists, which is a wonderful personality to mold into her work. Having one of her pieces sitting on the desk makes you wonder if they could just spring to life at any second and make your day a brighter place! Nina Bolen lives in East TX with her husband & their many animals. When she's not working with animals you can find her creating art. She's become best know for her whimsical fantasy artwork of dragons & other mythical creatures. Nina's artwork can be seen in publications such as, Teddy Bears & Friends Magazine, Teddy Bear Review, Bird Talk, Dollums Magazine, & Art Doll Quarterly. Nina studied fine art/sculpting/illustration at the Academy of Art University in San Francisco, but she still considers herself largely a self-taught artist. Nina's work is also available for free-lance illustrations, book covers, licensing & custom orders. 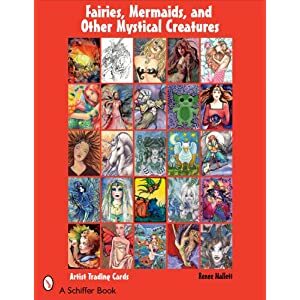 Is a must have book for anyone that loves fantasy art or collects ACEOs or ATC. I have over 15 pieces of artwork featured in this book. Check out the "Most wanted" section of the fall 2010 issue of Teddy Bear & friends magazine for some of Nina's work! I appreciate your respect for my ownership of my work & my copyrights. All art is ©2014 NinaBolen except where otherwise noted & may NOT be reproduced, printed, re-distributed, modified or posted elsewhere without written authorization. Copyright policies are enforced. Please do not use any of my artwork without my permission.